4o years ago we spent our Thanksgiving in a far away place. Today our thoughts go out to our soldiers who today are far from home. It is appropriate that today we consider the words of the first Commander-in-Chief, George Washington. As you read his thoughts, remember during the holiday season those who are on the front lines today, carrying out the tradition to protect the principles that our nation holds sacred, and thank them for their sacrifices. On this Veterans Day, every American should take time to thank one of our Nation's 24 million veterans. Their service, sacrifice, commitment to duty, and love of country has kept America free for over 233 years. Our Nation should never forget what we owe our veterans. 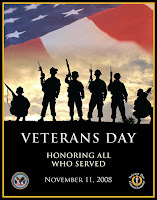 View the Secretary of the Army and the Army Chief of Staff Veterans Day Message. McCormick and Schmick's Seafood Restaurants are offering veterans a complimentary entree in honor of Veterans Day on Nov. 9, 2008.
business hours. See the Applebee's website for details. Golden Corral will continue their tradition of providing all veterans a free meal for Veterans Day. Golden Corral will provide veterans a free meal on Nov 17th. See the Golden Corral website for details.